It is a headache for iOS users that iPad and iPhone can’t be inserted a microSD Card to expend storage space, especially for those who love to watch movies on iPad and iPhone. Fortunately, some SSD have integrated Wi-Fi that can make you enjoy media on iOS devices wirelessly via SSD. Toshiba Canvio AeroMobile Wireless SSD is exactly ideal one SSD for iPhone and iPad streaming media via Wi-Fi. Its huge storage even can hold many DVD movies for iPhone and iPad streaming. Toshiba’s Canvio AeroMobile portable Wi-Fi media streamer delivered 128GB of storage where its platter-based competitors offer 500GB, 1TB, or more. It’s outfitted with an SD card slot, so you can augment its internal storage, as well as play media on iPhone and iPad you’ve stored on SD cards. This huge storage allows you put plenty of DVD movies for iPhone and iPad streaming. Of course, the premise is that you have changed DVD to iPhone/iPad playable format. As we all know, iOS devices only can read .mp4 .mov .m4v video. So if you want to play DVD on iPhone/iPad via Toshiba Canvio AeroMobile Wireless SSD, you should convert DVD to .mp4 .mov .m4v in advance. Pavtube ByteCopy is stronly recommened here to rip DVD to iPad/iPhone readable video formats with No.1 fast ripping speed while removing all copy protection in commercial DVD discs. This means you can rip any hottest DVD to iPad Pro, iPad Air and iPad Mini, iPhone 7, iPhone 6S, etc supported video smoothly, such as DVD The martian, Revenant, The Spectre 007 and other DVD movies you like. This DVD to iPad/iPhone converter offers iPad and iPhone preset for those we don’t know how to adjust settings to get better media antertainment on iPhone/iPad via Toshiba Canvio AeroMobile Wireless SSD. It has many other functions, learn more about ByteCopy, please read ByteCopy review. How to Copy DVD to Toshiba Canvio AeroMobile Wireless SSD for iPad/iPhone? Click on “Format” box, a list will appear, you can easily find the “iPad” category, to enjoy DVD files on iPad with 1080p image quality, you are suggested to choose “iPad > iPad Full HD Video H.264(*.mp4)” format for output format. For iPhone streaming, you can choose format form "iPhone" category. 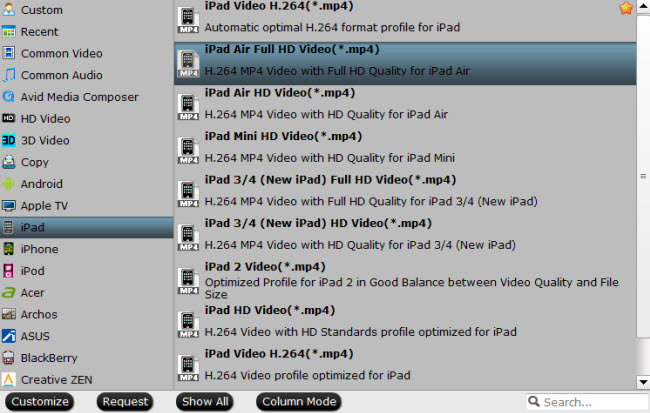 Normally, MP4 format from "Common Video" and "HD Video" aare supported by all iPad and iPhone models. Start the conversion by clicking on the green arrow start conversion button on the interface of this converter. After it completes, click the “Open” button on program interface to locate the created MP4 file. • Connect your device to the AC adapter and plug it into a power source. • When connected, the battery will start blinking. • When the light goes off, the device is fully charged and ready to use. 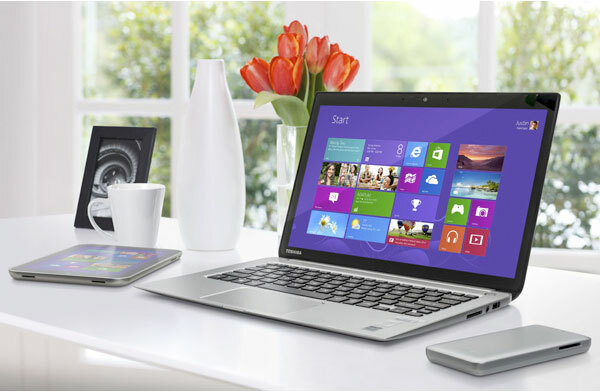 • Make sure the device is powered off before you attach it to your computer. as a Toshiba EXTERNAL drive (either in "My Computer" on a PC, or in "Finder"
driver. After installing the driver, you can now quickly drag and drop your files. • Apple® device users: Download the app from the iTunes® store. • Android™ device users: Download the app from Google Play™. • Once inside the app store, search the applications for "Wireless SSD"
• Press and hold the power button for two seconds. The green power indicator will illuminate. • When the blue wireless light is solid, your device is ready to go. • Access the wireless settings on your mobile device. • You should now be connected. • Exit the settings and tap on the Wireless SSD icon. You’re now ready to stream your DVD MP4 videos on iPhone/iPad—all wirelessly from your Canvio AeroMobile Wireless SSD. Dimensions 2.5 in. x 4.8 in. x 0.49 in.